Fleas, the most common external parasites to affect cats, can cause a variety of problems for your cat, including itchy, inflamed skin, hair loss, anemia and tapeworms. 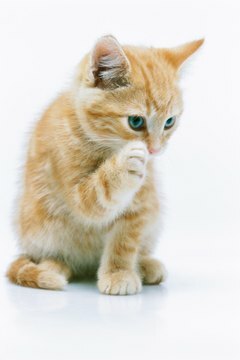 To prevent these pests from infesting your cat, use a topical flea treatment on your cat's skin. When choosing the best topical flea treatment, also called drops, for your cat, consider its specific needs. Before purchasing a topical flea treatment for your cat, decide what you want the product to do in terms of killing the fleas. Most prescription topical products, such as Promeris, Frontline, Fiproguard, Revolution and Advantage, start to kill adult fleas immediately upon application to your cat's skin. For severe infestations, you must kill the adult fleas feeding on your cat as quickly as possible, so these products work well for that purpose. Products such as Advantage II and Frontline Plus kill both adult fleas and work to prevent a new infestation by inhibiting the development of flea eggs and larvae into adult fleas. Obtain these prescription products from a veterinarian. Topical flea products for cats kill fleas and some kill the flea eggs, but certain prescription products also kill other parasites. Fiproguard and Frontline Plus both kill fleas, ticks and chewing lice. Revolution and Advantage Multi prevent heartworms and control roundworms and hookworms. Revolution also kills ear mites. You can safely use both Frontline and Fiproguard Plus on pregnant or nursing mothers, according to the Pet Education website. Apply each of these topical treatments to your cat monthly. You apply all topical flea drops to your cat in the same way, by squeezing the small tube of liquid in between the shoulder blades and rubbing the solution into the fur. The oil-based products contain active ingredients that absorb into the cat's bloodstream to protect the cat against fleas and any other parasites the particular medicine works on. You can use most topical treatments safely on kittens as young as 8 weeks old, such as Revolution, Promeris, Frontline, Frontline Plus and Vectra. Use Advantage Multi on kittens 9 weeks or older and at least 2 pounds in weight. The American Society for the Prevention of Cruelty to Animals recommends consulting with a veterinarian before using the products on kittens. Never use a topical product designed for dogs on cats, as these products contain ingredients that can be deadly to cats. Make sure that the topical flea medication is appropriate for your cat's weight before purchasing. When considering a topical product to apply to your cat, ask your veterinarian for recommendations of prescription or over-the-counter products. Due to reports of toxic reactions in some cats to certain over-the-counter products that contain permethrin or pyrethrin, avoid applying them to your cat, according to the Pet Product Advisor website. Though some over-the-counter products don't contain pyrethrin, they may contain etofenprox, resmethrin, or phenothrin, synthetic versions of pyrethrin, according to Pet Education. After applying any topical product to your cat, watch for signs of illness or any skin reactions at the application site. For serious reactions, such as vomiting or lethargy, seek immediate medical care for your cat.